Quarter obverses (heads side) show where they were made, with mint marks of either a ‘P’ or ‘D’. Uncirculated coins "are hand-loaded into the coining press and struck on specially burnished blanks, yet have a soft, matt-like finish appearance," the U.S. Mint’s website describes. The coins are "made like circulating coins (which are used every day as money), but with a special process that produces a brilliant finish." 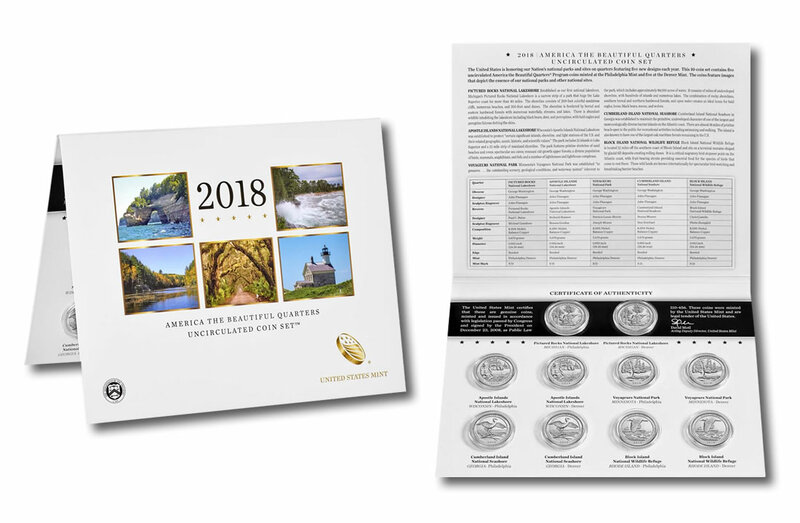 The ten coins are mounted in a folder that has descriptions of the sites commemorated, quarter specifications, and a United States Mint Certificate of Authenticity. Available for $12.95, order it and other quarter products from the U.S. Mint’s website, right here, or by calling 1-800-USA-MINT (872-6468). This year’s set is the ninth one in the series. The Mint no longer offers any of its past annual sets. They registered sales of 42,104 in 2010; 40,709 in 2011; 42,223 in 2012; 43,217 in 2013; 31,364 in 2014; 28,968 in 2015; 29,559 in 2016; and 29,972 in 2017. A CoinNews photo of uncirculated quarters from last year’s set. It reached sales of 29,972. The United States Mint’s America the Beautiful Quarters® Program will feature 56 different designs through 2021, each commemorating a national site throughout the U.S. and its territories. I will miss this series of quarters when it reaches its end; these are some of the most attractive coin designs I’ve ever seen come out of the U.S. Mint. I fully agree, the US mint hit a home run on these designs. Nice to see their artists challenged from time to time lol. 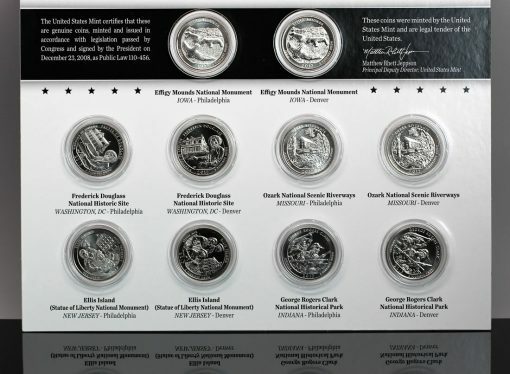 Now that we’ve had the occasion to once again be reminded of what they are really capable of coming up with at the U.S. Mint, perhaps we’ll be fortunate enough to experience some more examples of this very elite level of artistic design and minting execution on a much more common and consistent basis. I too believe these are the best designs ever created in the history of coins, especially the Effigy Mounds from 2017. A total homerun. Should be in a museum. Have you seen the current aftermarket prices on some of the America the Beautiful five ounce silver burnished (Philadelphia mintmark, not bullion) coins, whether graded or not? Almost all of them are going up steadily, some more rapidly than others, while the Hawaii coin has shot right through the roof. That’s another one of those typical “if only’s”, as in if only I had picked one [of those Hawaii 5 oz.] up when it was originally released by the Mint!